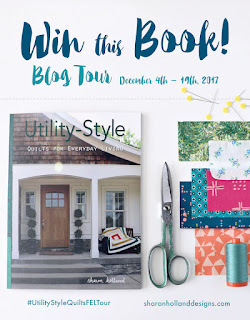 Welcome to my stop on the book tour for Sharon Holland's new book, Utility-Style: Quilts for Everyday Living, published by Landauer. I have collected several of my father's shirts and one from our son. I was never sure quite what to do with them, but knew one day just the right project would come up. When Sharon asked me to be part of the blog tour and I paged through the book, I knew I had found the perfect project, the Comfort quilt. The premise of her book is to make quilts to be used, a part of your everyday life. The shirts from my father were ones he used for everyday. He definitely favored the color blue, so I decided to name the quilt Workday Blues. The pattern calls for 8" squares and I was able to cut enough for a quilt that is 48" by 56", a nice size to cuddle with. I felt there was enough going on with the stripes, so I didn't add the little corner triangles, as shown in Sharon's quilt. In keeping with the idea of using fabric I already had, I remembered some favorites by Amy Butler and Lotta Jansdotter. For the binding, I used a wonderful check from the Vintage Picnic line by Bonnie and Camille. At this point it is quilted by stitching in the ditch (the batting I used said quilting could be 10" apart) but although it is already bound, sometime I want to go back and add some hand quilting. There was enough fabric from those five shirts to also make a coordinating pillow. It includes a pocket in the center square and part of the front placket. Instead of my usual zipper closure on the back, I used the placket from another shirt. This is a wonderful book for both the beginner and experienced quilter. There is basic information on sewing supplies, color theory and patchwork basics, along with "utility style tips" for each of the featured quilts. There are so many projects in the book I want to make--it's a book I will return to again and again. Stop by Sharon's post to read more of her thoughts on the book. There is also a free quilt pattern (Roman Stripes) to accompany the book, and an erratum notice. 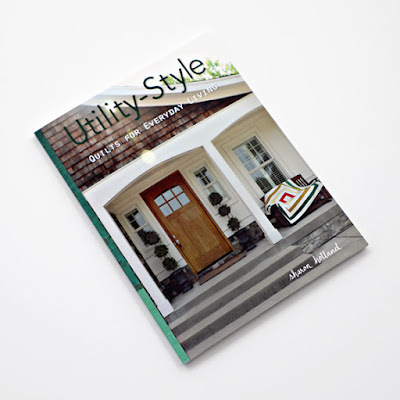 She has a link to signed copies of her book in her online shop--a great gift idea for you and your quilting friends. If you haven't been following along, you will want to check out the other stops on the tour. 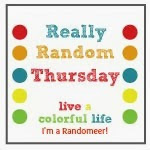 Thursday 12/14 Cindy Wiens - Live a Colorfullife: You are HERE! Sharon also gave me the opportunity to give away a copy of the book (open to US residents only). Leave a comment and let me know if you have ever used clothing in a quilting project. I have made a few boxy zip pouches from old men's dockers pants and have added a few pieces from cotton shirts to scrappy quilts. Love your projects! i haven't done this, BUT....my husband is saving t-shirts for a quilt, aha! Cindy, what memories in your quilt and pillow. Loving that closure too with the button up. I have a pile of shirts that have been waiting for their calling. This is perfect. And what child wouldn't be delighted by a pillow with a pocket to keep something special in? That is really wonderful. I love the yellow/blue combination too. I do enjoy using old shirts in my quilts. I HAVE used a shirt as a pillow and using the placket for the backing closer as you did - such a fun detail! I have a Christmas quilt with the red and green houndstooth fabric from clothes I made in high school. I had a thing for houdstooth. I haven't used clothing in a quilt project yet, but I am using remnants leftover from making my daughters' dresses! So B+ for effort, right? 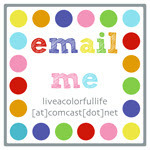 <3 Beautiful post! I like to include used clothing in quilting projects. I made a small chenille quilt using old shirts, and several pillows. Never but that would be fun! I have used jeans for guy quilts frequently!! Thank you! I have never used clothing but I love the idea of shirts. Love this book. I have only used scraps from things I have made to wear, but have not deconstructed clothing to sew with..yet. I love your closure on your pillow. What a clever idea. I volunteer at a thrift shop so perhaps I can pick up some shirts there and try that technique! I haven't done any yet, but I have bought a couple of thrift store shirts with the idea of using them in a quilt. I have used some scraps of clothing in a couple of quilts. The thrift store shirts are pricey by me so I can't justify using them. Looks like such a great book! I’ve never used clothing in a quilt, but I think it’s truly a wonderful way to make a memory quilt. I used a well-worn and much loved pair of corduroy pants for some pincushions. There were parts that remained unworn. I've also disassembled several less than flattering dresses for the fabric. Your quilt made with shirts is lovely. I like the idea of adding hand quilting to the squares. Using the placket on the back of the pillow is great idea. Thank you for the ideas. No, so far I haven't used clothing in a quilt project. Although, I've seen some very nice quilts made from clothing, and I think of the memories that must be in them. I am not one to really use clothing in a quilt but I had a fave linen dress that I could not part with that was fraying at the seams. I cut that dress up for fabric and it is in a couple of quilts now. I also have cut up denims from family members to make projects with. I made a simple wall hanging after cutting up my 3 daughters prom dresses. Now need to make 2 more. Gotta be fair, one for everyone. I have cut up flannel shirts and denim jeans and made rag quilts. My daughter tearfully asked me to please make a quilt out of her favorite flannel pjs. They gad polar bears all over them. What's a mom to do? I used them and some flannel nighties to make her a double bed sized quilt. She loved it. 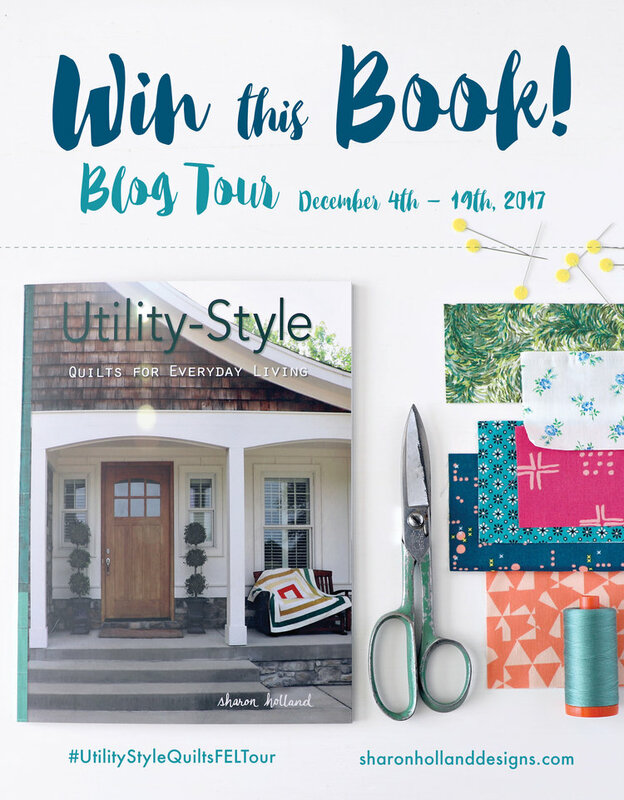 I know I am not eligible to win the book, but I just wanted to stop by and tell you how much I love the simplicity of this quilt! Sometimes, simple patchwork is the perfect pattern! And I'd never used clothing, although I have on occasion kept a much loved shirt or blouse with the intention of cutting it up for a quilt. But you know how it is, so many quilts, so little time! I am currently making a quilt from my daughter's old clothes. It will be a high school graduation gift this spring. I have made T shirt quilts, but no other quilts from clothing. I have made t- shirt quilts for my grandsons to celebrate their soccer years and high school graduation. I use men's shirts a lot in quilts. I have made jeans quilts and tie quilts in the past. I'm using a skirt I found at the Goodwill Store for some little triangles in this year's BOM. Thanks for the giveaway! I have been collecting men's cotton shirts to make a quilt, but haven't found just the right idea yet. I know I'd find so much inspiration in this book! Last year, I made a quilt for each of my children and added in fabric from my son's favorite plaid shirt. It had been ripped and was not feasible to patch, so I used it to remind him of how much he loved it! It turned out great! Great use of your Dad's shirts. Love the pillow with the pocket and the placard closure too. Brilliant! I have a box of my Dad's clothes that I've been hanging onto for years and years. Someday I'll use them. I haven't yet, but I've saved some special shirts that my brother used to give to my dad on Christmas and his birthday. As you can imagine, I've been looking for the "just right" project. This might be the one--not too "frilly", something he would use, that would show off the shirts, and feel like something Dad would have liked. Very "every day". I haven't used clothing in a quilt but have a bag of old baby clothes from when I was a child -50 yrs ago shhhh😶 that I am afraid of cutting into. I love the shirts you used and the pocket and buttons on the pillow! I love that you have some of your dad's (and son's) shirts in a cozy quilt! Shirt fabric is one of my favorite kinds of quilting fabric! I've made a few quilts with only-shirt-fabric, and many quilts with partly-shirt-fabric. I also love recycling T-Shirts into quilt fabric, and even jeans! I love your quilt! And that backing is so pretty! I have not used any clothing fabric yet but tragically, my only sibling died by suicide in October and I plan to make a passage quilt using some of his work clothing. I was really inspired by your quilt! Thanks for a chance to win a copy of this fabulous book! I've just made a baby quilt using my coworkers daughter's baby clothes. It turned out really nice. I just had to use some iron on Pellon to keep the shape. I make T-shirt quilts all the time, but just last year made a couple of quilts that incorporated other types of clothing. Even included a small portion of a baby blanket! Not yet, but someday I'd love to make a quilt from baby clothes! I haven't but several of my friends have. They turned out beautiful.